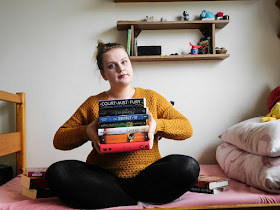 Girl with Cloudy Head: Reading one book at a time? 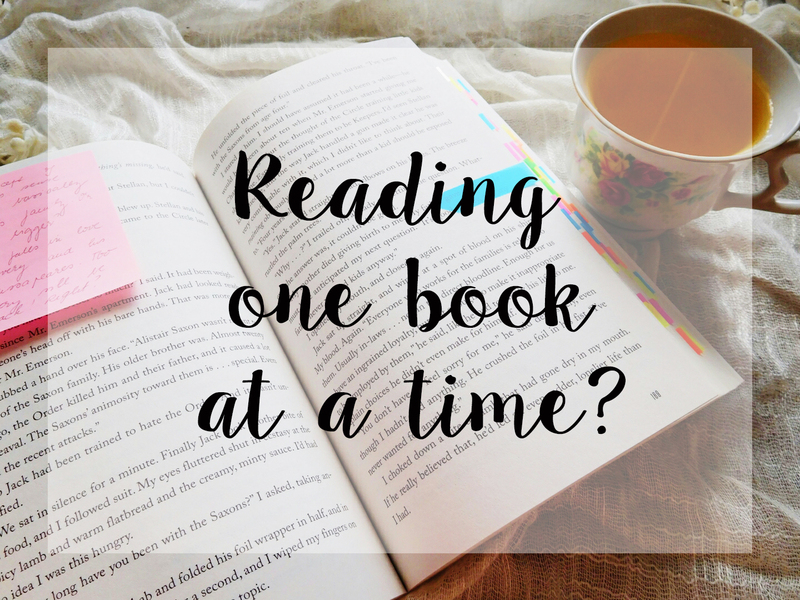 Reading one book at a time? When you think about it, books are magical artefacts containing infite number of worlds to which we can travel through imagination. If that's not magic, then I don't know what is. Though most people read one book at a time and devote to it all their time and energy and imagination, it doesn't work for me. I need diversity. I need to have options. I need to read them all at the same time because my TBR is threatening me to suffocate me in my sleep. And that's a really dangerous image. I don't get the plots confused or the characters so it doesn't affect my reading. Only in that aspect that I get more reading done. I'm one of those people who reads many books at the same time and their currently reading pile on Goodreads has no ends. Why? Simply because I read on diferent devices. Let me show you. When I'm home or in my dormroom on campus, I always like to have an actual book to read because hello, the smell is just amazing and don't let me start on the moment when you take it in your hands and open it for the first time. I think we can establish that I like smelling and holding books... and hugging them. No matter the technology, I'll always come back to actual books because it's just makes it even better when you can actually hold it and turn the pages. The feeling of the paper underneath your fingers and those glances at the cover which is utterly beautiful makes it all more pleasant and relaxing. Besides the actual book, I like to read an e-book. I got my first Kindle for Christmas about three years ago and since than, we are inseparable. I get why many people are negative about them because, let's be honest, they're not as cool as books, but on the other hand those little magical things are soooo helpful. For instance, I'm major in literature and we have a lot of reading. I cannot imagine taking all the books to school. My kindle though is Superman in disguise because it carries all my library and makes my life so easy. So when I'm on trian to uni or in a bus to school, I take out my Kindle and read. It's lot more comfortable than with actual book. Not to say that some people don't understand the importance of a book and can damage it. Then there are times when you can't really hold your book although you wish you could read. This is mainly when you're cleaning your room or cook or do something similar. In that case I like to put on an audiobook and listen to it. Many people find it difficult to focus on it, so it may not be for everybody, but I personally LOVE IT. Especially when the narrator is really good and can do a lot of different voices, I'm sold. Recently I found amazing combination of an audiobook with coloring book. That's like the ultimate relaxation time. Some books are even better in audio form. For example the Throne of Glass series. Man, those names are really dificult to read less alone pronounce, so this is where the audiobook is super helpful. Let's talk: Do you read on various devices? Do you like reading more books at a time or not? What's your favourite thing about actual books? Do you like audiobooks? I actually only read physical books, because I don't have an e-reader, and audiobooks tend to get on my nerves bc the pace can be a bit slow, and I'm not great at remembering things I've only heard. But I can see how all three could come in handy!!! Also super random question but how do you edit text onto your photos? I love them! 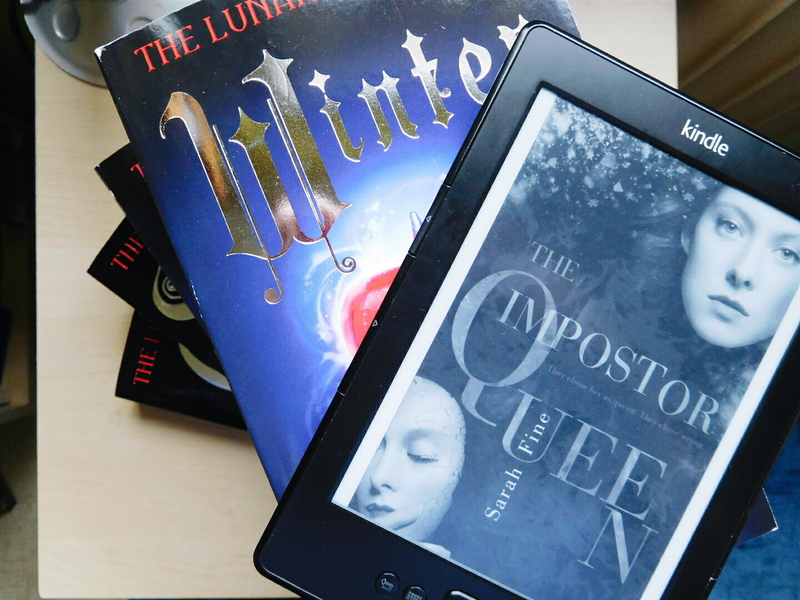 I *always* read two books- one physical, and one Kindle- because just like you, I have to read one on each! I have no idea why, I just do! I read my Kindle books for awhile and then I read my physical one, always before bed. I can't do audiobooks though, I am one of those people who simply cannot focus- though I love this idea of the coloring book along with it, I might be able to do it if I actually could focus like that! I wish I could read multiple books at a time like you! But I have a horrible memory, and tend to mix up what is happening in which book. That's awesome how you can read several at a time though. (And yes the Throne of Glass names are super difficult to pronounce.) XD Great post! Thank you! Reading multiple books at the same time may not be for everyone but even I read sometimes only one book at a time and it's just as much fun. I only read physical books and I feel like I can't concentrate on more than one book at a time. LOL. I'm usually reading two books at once, one on my Kindle and one physical book, but the ebook is pretty much always a non-fiction book. I am one of those people who would probably get mixed up if I read two novels at once, so I tend to read a physical novel (fiction covers just tend to be prettier than non-fiction covers, so I like to have actual copies of novels!) and then have a non-fiction book on the go on my Kindle which it usually takes me longer to get through. I cannot remember the last time I read only ONE book at a time haha. Like you I use multiple devices. Generally I have at least one physical book and an audiobook on the go. For the past few years I've also been slowly making my way through the Song of Ice and Fire series at the same time (I read a chapter or two every few weeks while reading other books). You have my respect because the Song of Ice and Fire is such a beast of a book! I was thinking about reading it but it still scares me a little. I totally get why you need to be reading more than one book at a time. My TBR pile is also huge, and I wish I had the talent of being able to read three or even five at a time but...I just don't think my concentration spans that far. It's not that I can't finish a book, it's just that it's difficult to stay fully aware of what is really going in each individual book on if I'm reading a bunch at the same time. Five is a huge number and I think most people would feel overwhelmed by it. Sometimes I wish I had superpower and I could read books superfast because then all the troubles with TBR pile would disappear! How awesome would that be? I usually read two books at a time: one on my ereader, and one as a physical copy. When there's school, I read my physical copies at school and my ebooks at home, and during summer vacation, I read my physicals at home and my ebooks when we go outside. It's become a regular habit for me and it definitely works! Great post, Simona!